HomeChanging the world is easier than you think! Changing the world is easier than you think! 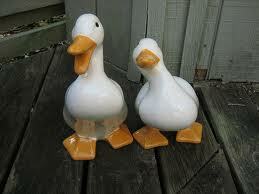 I was out driving a few days ago and passed a house where the front yard was FULL of ceramic duck statues…30 or more. The duck army was in straight rows on the ground. They were all sizes and colors. My first thought was “what an ugly thing to do in the front yard.” My second thought was “I bet someone makes those things in the garage and is trying to sell them. Tacky!” Notice how easy it was for me to create a story based on what I was seeing. Just for the record, my next thought was, “I’d never have anything like that in front of my house!” I drove on feeling rather superior. Later that day, I drove back on that street and noticed an older woman with two small children. The children were now putting the ducks in circles. HMMMM. What a shift in perspective I had. The stories I had made up of tasteless inferiority were giving way to a grandmother-figure helping two little ones create a world of make believe. My judgment gave way to the delight of watching giggling toddlers redesigning their world. So, why the story about ducks? It’s really a story about how the choices we make define how we experience the world. Notice how I easily created a story based on partial information. I was simply driving along, observing and jumping to conclusions. I easily judged the character and motivations of people simply by what I saw. Now imagine what changes when I make the same drive being curious rather than judgmental. In this scenario I drive by a very interesting house and smile at the sight of the duck army. No judgment, no conclusions. And I go about the rest of my day being curious and open to whatever might show up. Let’s apply the story of the ducks to leadership. As a leader, I get to choose how I see my world. I can question people’s motives (judging) or I can be curious about why they make their choices. So instead of jumping to conclusions, I wait to see the outcome or better yet, ask what was involved in the decision. My perspective becomes the difference between seeing people as inferior and the possibilities that open up when people are seen as unique and creative. It seems like such a subtle point and yet, how I see people defines how I show up in the world. Remember the ducks – absolutely nothing changed in the story but how I was seeing it. Here’s your choice – seeing a world of possibilities or seen a world of scarcity… Seeing people as “people” or seeing them as “objects.” Here is something you can try – spend today practicing possibilities. It’s as easy as “wondering” rather than “judging.” And think of the power! And the truth is – by changing your perspective, you can change your world.